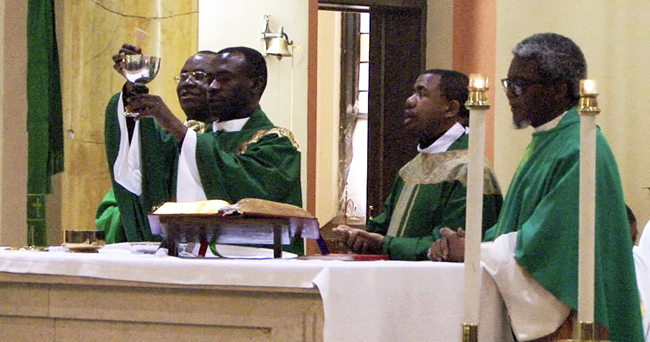 Father Livinus Ugochukwu (center), consecrates the Eucharist at a Mass Jan. 25 at Cyprian Church, Philadelphia, with the Igbo (Nigerian) Catholic community at the parish. Joining him at the altar are, from left, Fathers Onyeabor Ugochukwu, Linus Ugorji and Austin Odimmegwa. 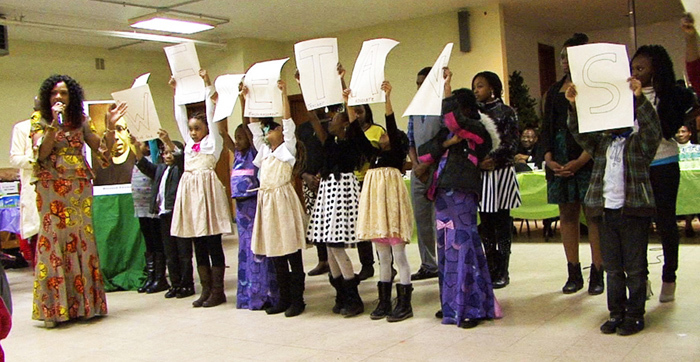 Chisom Orji, left, directs children of the Blessed Iwene Tansi Igbo Catholic Community at St. Cyprian Parish during a presentation in the parish hall that followed Mass Jan. 25. St. Cyprian Parish in West Philadelphia hosted a Mass for the Igbo Catholic community, immigrants from Nigeria who have settled in the parish, on Sunday, Jan. 25 in celebration of the feast day of Blessed Michael Iwene Tansi. He was a Nigerian priest who died in 1964 and was beatified by St. John Paul II in 1998. The Igbo Catholics await one more miracle attributed to Blessed Michael’s intercession that may lead to his canonization. Father Livinius Ugochukwu, chaplain for the community, performs a song along with women of the community from the album dedicated to their patron, Blessed Michael Iwene Tansi.